The Washington Street Thoroughfare project is providing a safer commute for traffic along this busy corridor. The roadway portion of the project extends from the eastern side of Grandview Drive to just west of Haryan Way. Crews will start building the completely new roadway just west of Arbor Drive and widen out to two lanes in the eastbound direction just past Ravine Drive. 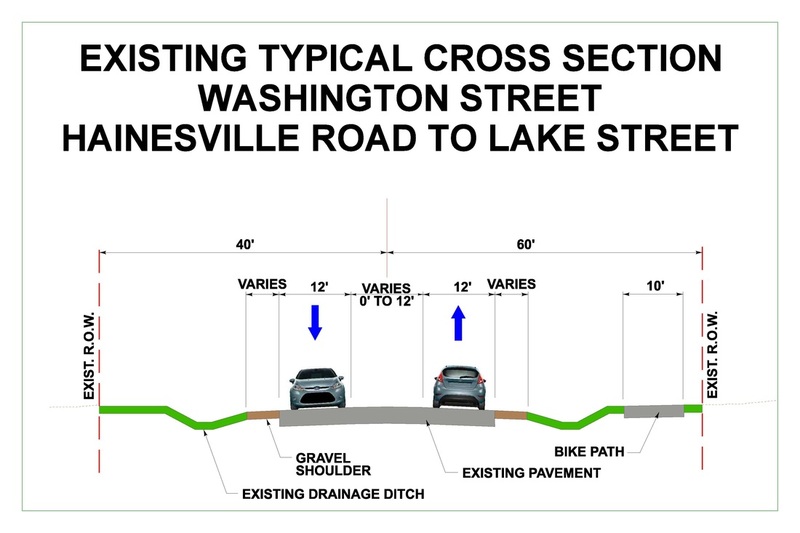 Washington Street will be a four lane wide road with left turn bays at Hainesville Road and an open median for eastbound left turns into all of the driveways between Circle and Lakeside Drives. 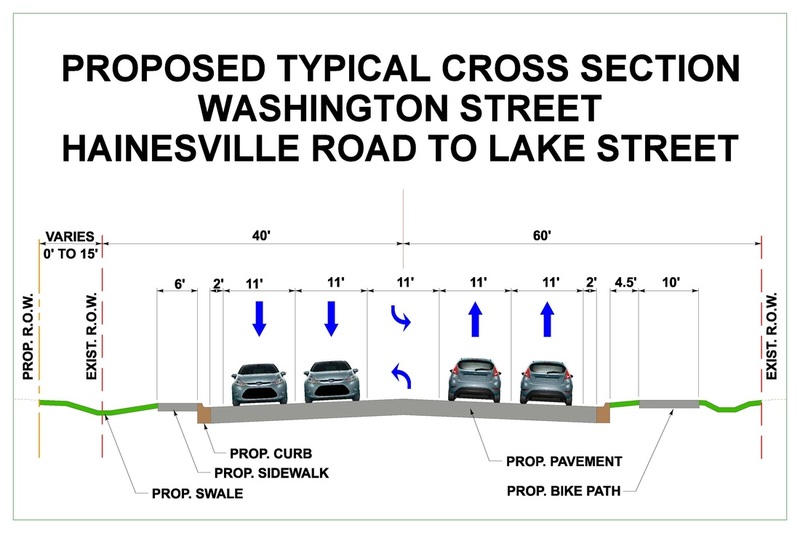 This project will also replace the bike path along the southern side of the roadway from Grandview Drive to past Haryan Way - that bike path will still connect to the existing sidewalks at Hainesville Road. The project includes new driveway aprons from the edges of the new road’s pavement to the right-of-way lines. Because the new roadway will be a bit higher/lower at most of the driveways, we will replace the existing apron to provide smoother transitions. A new storm sewer system will be installed along the roadway to collect stormwater and deliver it to the Lake County Stormwater Runoff site. That site is designed to control flows and clean stormwater before it enters Highland Lake. Stormwater at the eastern end of the project flows towards Haryan Way and then north across Washington to the fields. There will be new traffic signals at Washington/Hainesville with video detection systems to help control the flow of traffic. While the majority of the medians will simply be striped as turning lanes, most of the median from Lakeside Drive to Haryan Way will be landscaped. We will install curbs and topsoil to provide a grassy area that could be planted with native shrubs and flowers in the future. Crews will install new sod in front of homes/businesses and special seed mixes along the wild and wetland areas. There will be new retaining walls on either side of the roadway near Highland Lake’s Hartnett Park to minimize the intrusion of the project work into this sensitive wetland corridor that filters stormwater and feeds Highland Lake. Before the actual roadway removal and replacement begins, crews will build temporary pavement and driveways long the north side of Washington and install temporary traffic signals at Washington/Hainesville. During the first stage, all traffic will move north onto temporary pavement and crews will perform all work necessary to construct the new eastbound lanes. Once that work is completed, additional temporary pavement will maintain access at Hainesville and the various side streets/driveways before moving traffic onto the new pavement. During the second stage, crews will build the new westbound lanes and the majority of the medians. After that work is completed, stage three will have westbound traffic move onto the new pavement and crews will complete any remaining median work. We hope to start work summer/fall 2015 and complete the project in the late fall of 2016. Please visit the schedule page for the most current roadway schedule information. This project will improve access from east to west for residents of Round Lake, Round Lake Park, Round Lake Beach and Hainesville and should result in decreased commute times.